The exhibition BLANK__SPACE, on view from 29 August to 29 November at Galerie m Bochum, features works by 19 artists who engage with diverse aspects of space. The selection demonstrates just how multifaceted and individualistic artists’ approaches can be to incorporating this element into their works. The question almost inevitably comes to mind of what actually constitutes a space. The result is a captivating interplay not only of transparency, delicate white tones and materials, but also of lines, planes and light. The exhibition presents two neon works by François Morellet and expansive installations realized on site by the artists Carla Guagliardi, Evelina Cajacob, Antje Dorn and Jan Wawrzyniak. All of these works – François Morellet’s semicircles, Carla Guagliardi’s seemingly floating water-filled glass spheres, Evelina Cajacob’s curtain of wax-soaked paper and Antje Dorn’s cable installation – assert both an independent presence and a visceral attraction. As cornerstones of the exhibition, they enter into a contrast-rich, in some cases perplexing dialogue with one another, fracturing with their lightness and wit the elegant atmosphere and subtly changing impressions that arise when looking at the paintings and photographs on display. Especially compelling here is the encounter between artists of different generations. 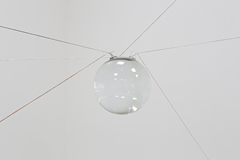 The works of François Morellet, Lee Ufan and Qiu Shihua relate in complex and astonishing ways to the younger positions. 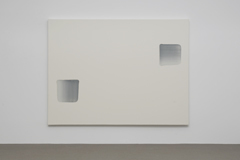 Each of the artists pursues his or her own minimalist strategy in which space and white surfaces are essential elements.